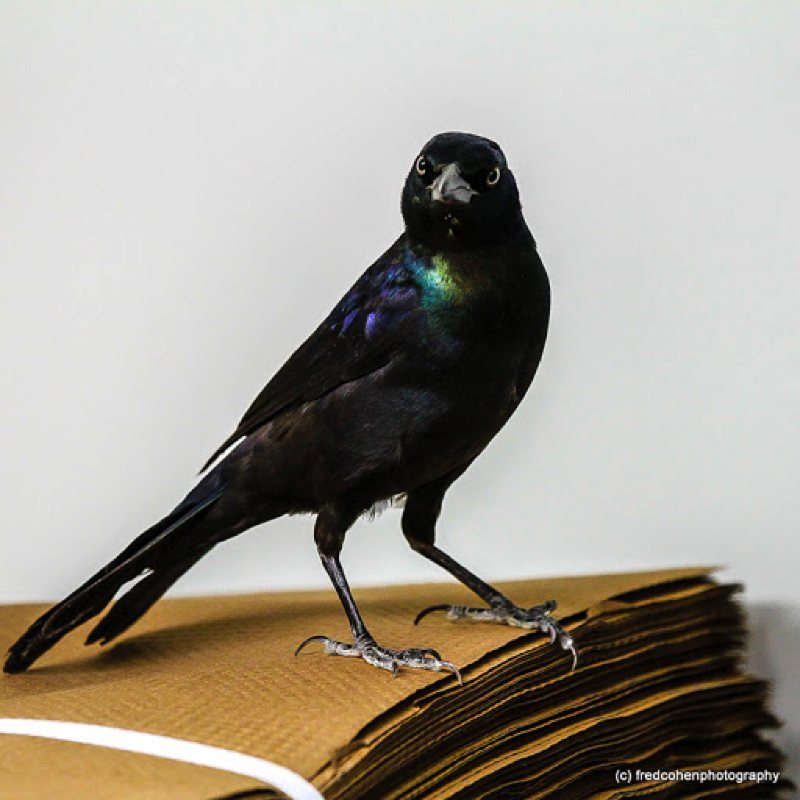 It was a pretty bad prognosis: a broken wing, an eye injury, and a cough that suggested a respiratory problem – from the beginning the grackle that came to the Wild Bird Fund was going to have to fight for its life. He was just a youngster, not yet in full plumage, when we splinted his wing and put him on cage rest to let the bone set and get treatment for his eye. That was when staff really got to see the beautiful plumage of this bird, who from far away looks simply black, but close up shimmers in iridescent blues and greens. His wing healed beautifully, and he flew well with the other birds in the flyway, but he was still so weak and lethargic – so unlike the outgoing personality known to grackles. Common Grackles (Quiscalus quiscula) are one of the most commonly-seen native birds in New York because they forage in open areas and are charismatic, strong-willed birds that aren’t afraid of anything, or anyone. They are fighters, and our grackle needed to be to get better. Slowly, so slowly, we started to see it: one day, the bird was a little bit harder to catch; another day, he had started knocking things over out of curiosity; after a few weeks he was dominating the flight room, and had become so aggressive towards other birds that we had to house him in a large, separate cage in the prep room and let him out to get flight time every day. As he got stronger, he got harder to catch, so we ended up having to surprise him inside his cage when he went to eat. We knew that he was going to make it when, near the end of his stay, he began singing for us. The grackle’s outgoing personality made him a favorite at the Center, and made it both harder, and more rewarding, to see his release. 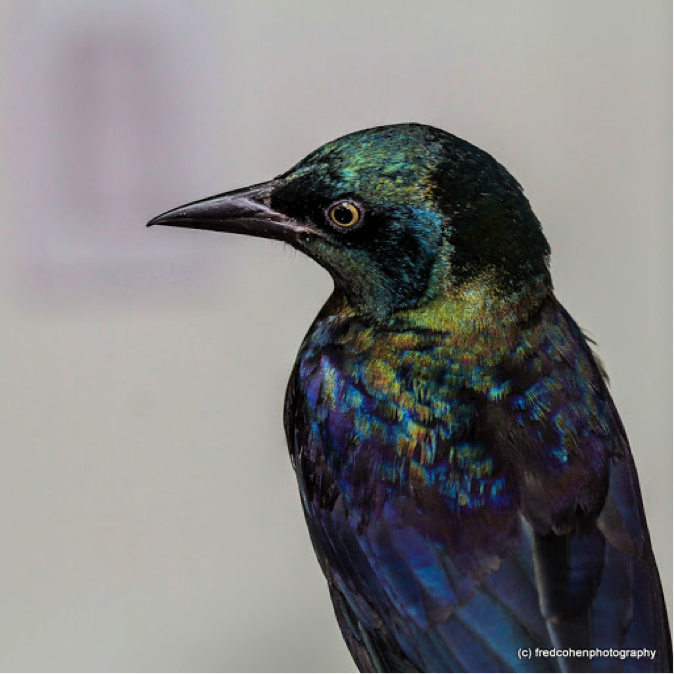 Befitting a social bird, he was released into a flock of other grackles where he was soon playing and flying acrobatics, chattering loudly with the others, sharing the adventures of his stay at the Wild Bird Fund.